Become a BFF at Friendly's for Free Ice Cream! Friendly's has changed their Birthday Club to the Best Friends of Friendly's Club. Join now and get a free three scoop sundae. What could be better than that? I think the coupon is good for a month once you join. When I was in middle school and I actually liked to shop, my mom used to drop friends and I at Westfarms Mall. Among the new found freedoms of being away from my parents, I found this sweet treat in Mrs. Field's Cookie Cups that I could buy with my own money. What an addiction, those frosting filled chocolate chip cookies! I loved the frosting filled cookies. In fact, I even bought Mrs. Field's Cookie Book in hopes of making the same recipe. To my dismay, the recipe wasn't in the book...but there were some other pretty good recipes in it that made it worth keeping! Later that night, Husband ask for dessert. I send him down to the chest freezer for the sandwiches, silently hoping he won't look too far and find his birthday present. If he did, he says nothing. He emerges from the basement, cookie in hand, and complains to me that he should have known how small they would be, the box being so light. Later on, I bring up my own cookie sandwich. He's right. It is small. But it's actually refreshing -- in a world of supersizing, it's nice to see that Breyer's and Mrs. Fields know that this works well as a "good things come in small packages" kind of treat. If it were bigger, I'm sure I would have finished it. But truth be told, I was really truly satisfied with the three-ounce sandwich one serving had to offer. The only thing that struck me as strange was the number of servings per container: five. Yeah, that's right. Five. I have never gotten anything in an odd number. I have gotten four, or six, or eight, but never five. Five doesn't fit neatly in a box. Why five? It does make me think of growing up in a family of five -- six ice cream treats? Who got the last one? Four cupcakes? How do you divide that? But then again, five causes those same problems for the family of four or the family of six. Overall, I was happy with my purchase. Husband, if you have complaints, don't eat 'em! I'll gladly eat your remaining one and a half sandwiches! Sort of last minute but if you have a Ben & Jerry's nearby swing on in Tuesday, March 24th and donate one (or more is accepted of course) non-perishable food item and receive a scoop for $1! What's better than that, getting a scoop for a buck and doing good for others. All donations will be supplied to your community's local food bank. Combine butter, sugar, brown sugar and egg yolk in a medium bowl. Add flour, baking powder, salt and green food coloring. Mix well. Cover and refrigerate about 4 hours or until firm. Roll dough on floured surface to 1/4 inch thickness. 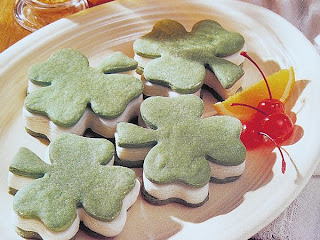 Cut out cookies with shamrock cookie cutter. Place on ungreased cookie sheets and bake 8 to 10 minutes or until cookies are lightly brown around the edges. Remove cookies and place on wire racks to cool. Cool completely. Remove ice-cream from freezer and let stand at room temperature to soften slightly, about 10 minutes. Spread 4 to 5 tablespoons ice-cream onto flat side of half of the cookies. Place the remaining cookies, flat side down on ice-cream. Press cookies together lightly. Wrap each sandwich in foil. Freeze until firm, about 2 hours or overnight. Seasonal variations....change up the cookie cutters and food coloring and make ice cream sandwiches for every special holiday! Here’s another banana based ice cream for you. I just love a good banana flavored anything and I wanted something to complement my Panettone Bread Pudding. This one is crazy easy. No cooking, just mix and freeze! With a banana masher, mix the bananas, brown sugar, brandy, vanilla and spices. Whisk in the cream and ½ & ½. Chill for 30 minutes. Stir to mix completely and pour into your ice cream maker. While it is churning, crush the crackers. Pour the crackers into the maker 5 minutes before the mixture is finished churning. 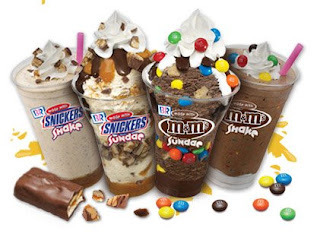 I just got a heads up from my friend Marsha about PJ Weekend at Bruster's ice cream. Wear your PJs in today (if they are still open!) and get a free single scoop waffle cone! The site is vague and doesn't even mention which weekend it is (but searching on the web turned up today) -- but it does say weekend, so maybe tomorrow too? We don't have Bruster's in Massachusetts or Rhode Island, so I can't even confirm for you. If anyone does go and turns up with any more info or feedback, please do let us know. I'm signed up for their newsletter now, so hopefully I won't miss this next year! Signing off so this can be posted and maybe, just maybe, you can get your free cone. Well of course you have to buy one to get the next free but what a deal!! Get to Baskin Robbins by 3/28 and you and a friend can enjoy a yummy sundae at half the price. Go to the site and print the coupon out to take advantage. We need your scoop on these scoops! 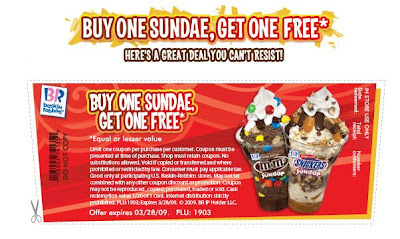 Here's the thing: I have three coupons for free Good Humor, Breyers, Klondike, or Popsicle products...they expire at the end of March and I need your help! Be one of the first to volunteer in the comments section (be sure to include your email address so I can contact you for your mailing address) and I'll send you a coupon. Your end of the deal? Review your product. Send me a quick email about your feedback on what you chose and how you liked it. Send a picture of you or your friends and family enjoying the treats if you want! We'll post your review and picture for the world to see! 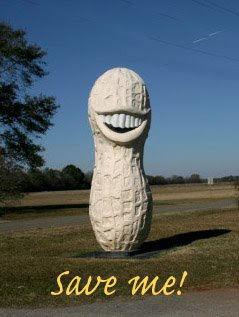 Take note....one more peanut item off the shelves and this time its affecting our beloved ice cream and a favorite brand of ours, Turkey Hill. Unfortunately a half dozen ice cream and frozen yogurt products have been voluntarily recalled by Turkey Hill because they contain peanuts from Peanut Corp. of America, the current focus of the ongoing salmonella investigations. These products were distributed in New England and eight other states on the East Coast. According to their website..."The company has not received any consumer illness complaints about these products, however we are taking this precautionary step to safeguard our customers and consumers." 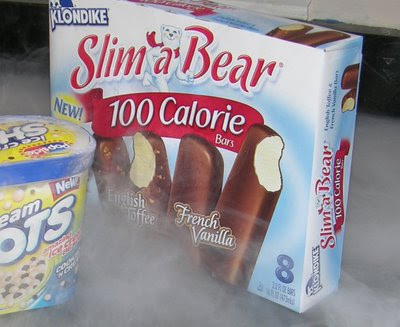 Have any of these flavors in your freezer? If so, return them to the store of purchase for a full refund or trash 'em immediately. And then run out and replace them with a yummy flavor not on this list...my suggestion and personal favorite, Choco Mint Chip. Can never go wrong with that one! Have questions? Contact Turkey Hill toll free at 800-MY-DAIRY.